This listing is for a talking combination lock panic alarm system with siren. It acts as a panic alarm system. The above video offers a full demonstration of some of the applications. We will also be selling these fully assembled and tested, so be sure to check out our store front! Please watch the above video carefully, and read the information below. This device is used essentially as a custom panic alarm. It has a default combination feature, and a custom combination feature. This is talked about more below. The above video offers you a full demonstration of how this device works. The below video offers step by step assembly instructions, so be sure to have a look! We also offer this in fully assembled form for a few dollars more, so make sure to have a look through our store! Please note that while the video above may say that an AC adapter will be included, it DOES NOT. Please see below for details relative to purchasing an AC adapter that works with this set. First of all, please note that there is a step by step assembly video below that shows you how to put this kit together. It also offers another demonstration of the uses of this kit. 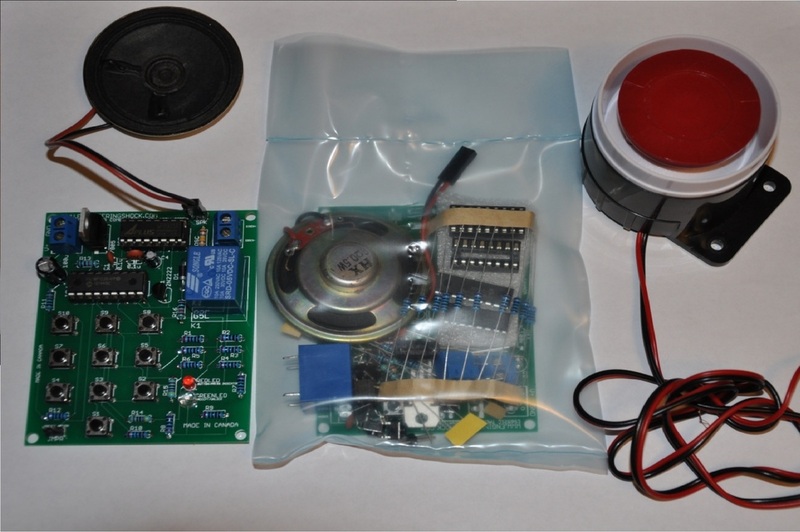 This kit comes with a plug-in 1/4W speaker that instructs the user how to operate the device. For instance, if you power the device up in default programming mode, the device will say "Default Combination", then "System Ready". If the user powers the device up in custom combination mode, the device will say "Enter Combination". When a four digit combination is entered, the device will say "System Ready". When the device says "System Ready", It means that the unit is waiting for the user to enter the correct combination. If the user enters in an incorrect combination, the system will say "Incorrect Combination". If the user enters in the correct combination, the unit will say "System Activated", and the green "Active" LED will turn on. In addition, the on board relay will turn on, and the siren will blare. The user must then press any button, and let go before the relay/siren are turned off. At which point the system will say "System Deactivated", and then "System Ready", indicating that it is now waiting for the correct combination again. The two pin header in the lower left corner is the deciding factor between the two modes of operation. If the jumper is shorted via the included two pin header connector, the unit will start in default combination mode, which is a pre-programmed combination mode (10, 10, 10, 9). This is the mode to use if your house or place of business is prone to blackouts. If there is blackout, the system will start back up in default combination mode when the power comes back on, which always has a combination of (10,10,10,9). In this mode, when power is applied the device will say "Default Combination", then "System Ready"; at which point only a combination of (10,10,10,9) will trigger the alarm. There is also a time-out feature. If the user takes too long to enter in a digit, the on board red LED will flash once, which indicates that the user has taken too much time to enter in the code. The user must now re-enter the code from scratch. If this seems complicated, just watch the above video. If offers a full demonstration. If the two pin header is left open (Un-shorted by the header connector), when the user powers up the device, the unit will say "Enter Combination"; at which point the user must type in a four digit combination. Once the combination is entered, only that combination will trigger the siren. Once the user has entered in this combination, the unit will say "System Ready". From there the unit waits for your custom combination to be entered in. Only that combination will trigger the alarm. 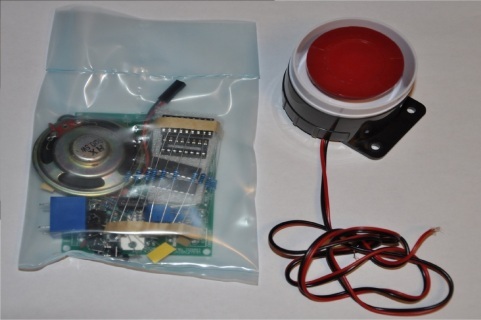 This kit is meant to act as a panic alarm. I will have other listings that have other applications. If the unit is always powered on, and someone is invading your home, or if you require an emergency alarm at your place of business, then this would work well for you. There should be absolutely no false triggering, as the unit requires a four digit pass-code. The main board has four mounting holes, and the siren has two mounting holes as well. In addition, the siren has a double sided tape layer on the back-side. All you need to do is pull the protective layer off, and you can stick your siren to a wall or project box. 2) A loud siren that wires directly into the board via an on board terminal block. 1) No AC Adapter will be included with this specific listing. If you want one to be shipped with this set, contact me prior to purchase, and I will ship you an AC adapter with this set for an extra $4. THE AC ADAPTER DOES NOT COME WITH THIS SET BY DEFAULT. 1) 7VDC to 15VDC supply. You can use a 9v battery as the input supply, but if you are looking to use this for longer periods of time, I suggest using a 7-15v wall transformer. 3) Soldering and DIY kit experience is very helpful.